Crabgrass is native to Europe or Eurasia and is distributed worldwide. It was introduced into the U.S. in 1849 by the U.S. Patent Office as a potential forage crop. Now, it is found in virtually every crop or non-crop situation. The two closely related species of crabgrass in the United States are large or hairy crabgrass (Digitaria sanguinalis) and small or smooth crabgrass (Digitaria ischaemum). Large crabgrass, a summer annual, is a member of the grass family. It is one of the most troublesome weeds in lawns. Crabgrass reproduces by seeds and and it has a prolific tillering or branching habit. A single plant is capable of producing 150 to 700 tillers and 150,000 seeds. Crabgrass plants are very adaptable to mowing height. Plants can produce seeds at mowing heights as low as 1/2-inch. Crabgrass seeds are dormant for a short period of time after they shed from plants. Seed germination is related to soil temperature. When the soil temperature at the surface reaches 55°F for four or five consecutive days, crabgrass begins to germinate. Seeds germinate best from early spring to late summer. Crabgrass continues to grow until midsummer when days become shorter. Vegetative growth slows and plants enter their reproductive stage. Purplish seed heads form until frost kills the plants. Plants that emerge early in the season and have a long period of vegetative growth are much larger and more competitive than plants that germinate late in the season. Crabgrass is found in almost every turf and landscape situation. It is prolific in lawns, golf courses, athletic fields, gardens, orchards, and waste places. It thrives particularly well in lawn situations. Once established, crabgrass tolerates both high temperatures and dry weather conditions because of its physiological makeup. Crabgrass species are often very competitive because they are C4 type (warm season) plants. C4 grasses thrive during the hot weather and abundant sunlight of the summer when cool season turfgrasses (C3 plants) are under stress. Crabgrass is very noticeable in lawns. It is a rapid growing, coarse textured yellowish-green grass that is conspicuous when found growing among fine textured, dark green cool season turfgrasses. The stems are spreading and much branched. Roots develop at nodes on the prostrate stems. The first leaf is only about twice as long as it is wide. It is tinged light purple and has a white strip running down the center. Both sides have silky, shiny hair. Leaves are 2/5- to 1/2-inch wide and 1/3- to 1-inch long. The leaf sheaths of large crabgrass seedlings are tinged purple and are covered with long stiff hairs. The ligule is large membranous, and toothed. A ligule is a thin membrane or row of hairs at the top of the junction of the leaf sheath and the leaf blade. Auricles are absent. Auricles are the appendages projecting around the stem from both sides of the collar. 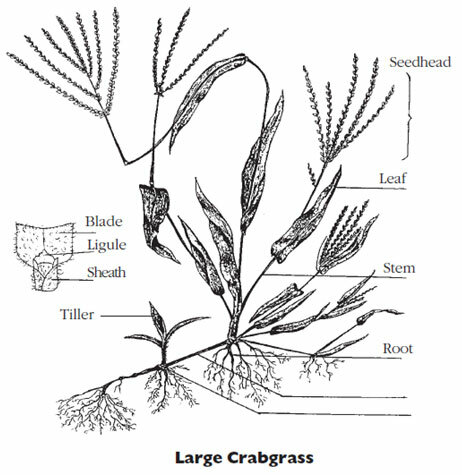 The basic principle of a crabgrass management program is to prevent re-infestation by seeds. Controlling seed production for several years will help reduce the viable seed supply. Crabgrass cannot be controlled in one growing season because of the great number of viable seeds that accumulate in the soil from years of infestation. A good weed management program in lawns is one that consists of both focused cultural practices and the use of herbicides as appropriate for the control of any given species. Satisfactory control may require several seasons of conscientious adherence to a good management program. Establishing a dense and healthy stand of turfgrass is the best way to control crabgrass and other annual weeds including grasses and broadleaf weeds. The proper mowing height and frequency, fertilization and irrigation are part of a sound weed control program and should be practiced throughout the growing season. Seed in late summer for new lawns. Crabgrass and other annual grasses that germinate in late summer will be killed by frosts in October or November. Mow your lawn at a 2- to 3-inch height of cut. The taller grass shades the soil and keeps soil cool. Crabgrass seeds do not germinate under cool conditions. Adjust your cutting height as appropriate for the turfgrass species. Water deeply once a week and avoid frequent light irrigation. Avoid summer fertilization. Crabgrass benefits more from fertilizer application under high temperatures than Kentucky bluegrass and other cool season grasses because of the physiological make-up of the plants. Crabgrass can be selectively controlled in turfgrass areas by judicious use of preemergence or postemergence herbicides. Timing is important for herbicide applications. The best time for preemergence application of herbicides is before or at the time that Forsythia is in full bloom, or when soil temperatures reach 55° F for four to five consecutive days. This is late April or early May in Massachusetts. Postemergence herbicides can be used when crabgrass is in the 2- to 5-leaf stage. Repeat applications may be required depending upon treatment specifics. For a details on current herbicides registered for control of crabgrass, refer to the latest edition of the Professional Guide for IPM in Turf for Massachusetts.